For those of you who blog, I'm sure you check your stats, right? It took me about three months to figure out that there even was a stats page that shows you the number of pageviews on your blog. My blog is purely a hobby thing. I don't make money off of it or anything, although I do have a nice little advertisement over there on the upper right corner for my Etsy shop, Bluet & Clover. I do this, blogging, mainly because it's fun and allows me get my creative ya-yas out. I have a nice flow of traffic over here, but nothing that would knock your socks off. Now there's a great advertising pitch. But I will say that sometimes some blog-related excitement happens. For example, every late November to late December since I started blogging, this post on making reindeer decorations becomes really popular. I noticed a recent spike in my blog visitors last week and don't you know... my "Reindeer Games" post has shot to the top of of my most read posts. The most popular search term of people who have found their way to my blog this week is "reindeer illustration." So I decided to do a Google image search with the same term. Lo and behold, there's my little deer.. the third image of all the reindeer illustrations out there in internet land. I know this isn't exactly a claim-to-fame accomplishment, but I have to admit that it's kind of exciting. 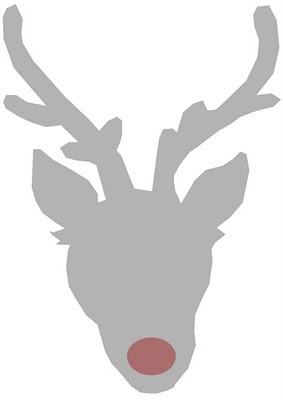 Of all the reindeer illustrations our there in internet land, my little deer head comes up third. I've said that twice, haven't I? Ha! that is actually very cool, especially being that the internet is so vast!